Fashion from, “Around The World” November 15th – November 29th, 2012! read below for, more info! 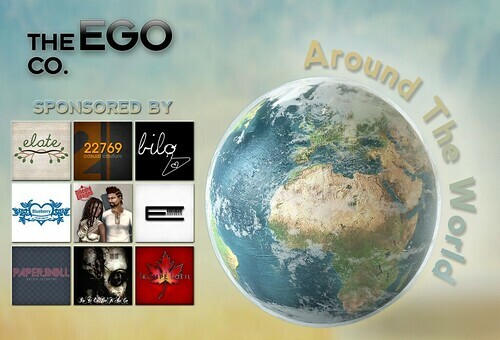 Another awesome event hosted by, The Ego Co.
As you may.. or may not know.. I have been an occasional blogger with, The Ego Co. for almost a year now, and the events, and people are amazing. I always try to remember to actually post on Ego but, I always cover the events here. Today I will do a post here, and one there as well! However, I will change it up so, remember to watch for me on The Ego Co. blog! This event is called, Around The World which features different fashion from, different cultures! In this post I am sharing with you, poses from Purple Poses, cute bracelets from Flaunt, a beautiful dress from, 22769 from the event as well as a new release hair from, Exile and this beautiful skin from, Modish and the cutest lil ankel boots from, Irischka Hotshot’s smexy, talented wife, Charlize Klaar! If you like the skin that I am wearing then, please check out my last post about, the Modish Anniversary Sale! These ankle boots are texture change by a hud as well! Make sure to wear first shoes, then HUD. If you are like me, and experience problems try to resynch the HUD. They are very cute, and nicely textured! All the “LOOK” info, is below at the bottom of the post! ENJOY! Time for your Urls and info!! ENJOY! Previous Post Modish Anniversary Sale! Pingback: Morgie peaking at the, Around the World event… « The Ego Co.